This is my first guest post since I have been blogging for food and cooking nearly two years on my Chinese food blog, a few months later on this English one. Yet I didn’t post any recipes here at first, just focused on reading my favourite food blogs. Bee from Rasa Malaysia is one of my favourite blogs that I’ve subscribed for a long time. When I first found her blog, I was impressed by her gorgeous pictures and attracted by her passion for Malaysian foods. I’ve tried many recipes from her blog that turned out to be hits in my family. As Chinese New Year is coming around the corner, Bee will be sharing a series of Chinese Recipes on Rasa Malaysia. She can be classified as an all-round Asian food blogger. You might have heard or tried the Peking Pork Chops, or Sweet and Sour Beef, that are also my Aussie friends’ favourites. In Chinese cooking, we do use tofu a lot. Especially fried tofu is a very popular dish in South Asia. An idea just came up in my mind, why not combine those popular dishes into one? So here comes the Sweet and Sour Fried Tofu. I tried to use as many veggies as I could, including onion, green, red and yellow capsicum, going with Jasmine rice, sprinkle black sesame seeds on top, creating a colourful dish looked like a rainbow. 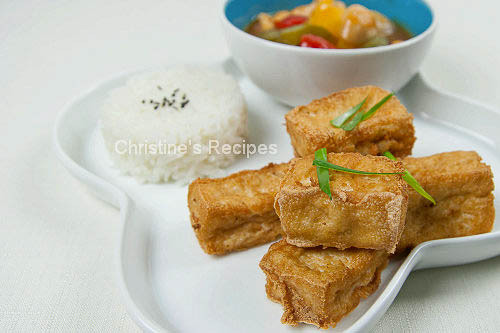 I also name this dish as 彩虹炸豆腐 in Chinese, literally translated as “Rainbow Fried Tofu”. For the whole recipe, please hop over to Bee’s blog. Many of you might have already known Bee’s food blog, Rasa Malaysia, because it’s one of popular blogs out there. If you don’t, do take some time to explore her blog, there are heaps of yummy recipes you can’t miss. Her blog is long-hauling for nearly 5 years, well-liked by a wide range of readers. It took me a bit surprise when she asked me on Twitter if I’d like to guest post on her food blog. I really feel honoured and excited to share one of my favourite recipes with her readers. Many thanks to Bee for the opportunity. Congras! This is a great dish. Simple and yet comforting. Looks like an awesome recipe, now more people will find your wonderful informative posts! mmm, that tofu looks so crispy and delicious! I love deep fried tofu! Beautiful dish Christine. Your Chinese recipes are always flawless. That would be great for my dinner today...mmm. Delicious! The little fried stuff looks so cute like this! yummy! OMG Christine! What a great dish and congratulations on your feature at Rasa Malaysia! You are right - she has got a wonderful wonderful blog! and guess what - so do you! !